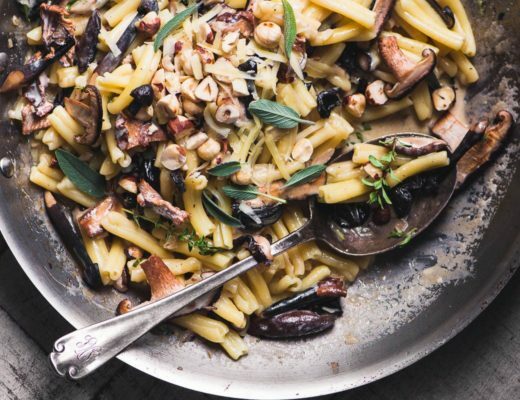 Some recipes are so self explanatory that it’s hard to s-t-r-e-t-c-h out the chit chat to a minimum post length. You’ve probably already conjured up in your mind the experience of biting into a perfect just baked brownie. And you don’t need me to tell you what a chocolaty glaze or crunchy toasted walnuts can do to that brownie. And most of us know what a little drop of whiskey brings to the party, so really, why should I bother? 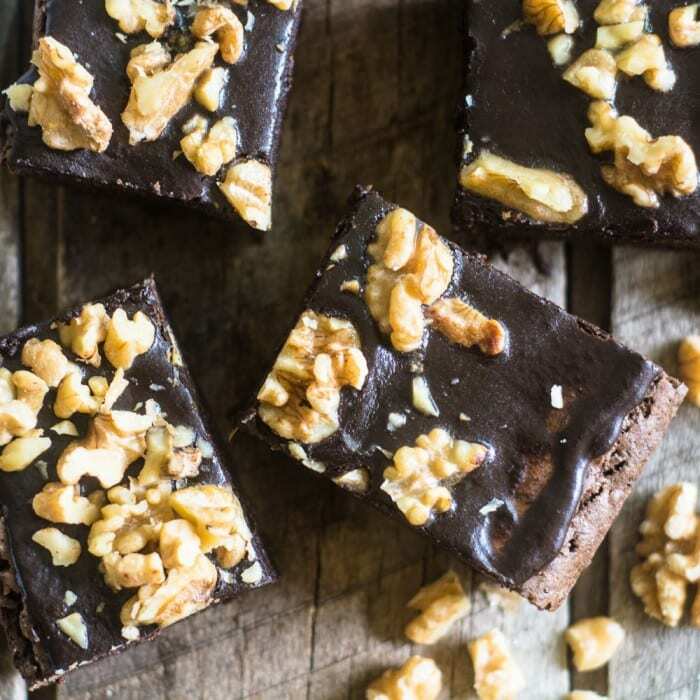 These brownies are pretty straightforward, but the chunky toasted walnuts and the hit of whiskey in the glaze makes them special. Special enough for date night or party night. Definitely something you’d be proud to bring to an office party or a bridge game. These are rich, earthy and — politically incorrect I know — manly brownies. The whiskey element is mild enough to please everybody, but assertive enough to be worth it. Whiskey Glazed Brownies are slightly adapted from The Hamptons: Food, Family and History. Melt the butter in a saucepan and add the chocolate, stir over low heat to melt completely. Whisk or beat in the sugar until smooth. Remove from heat. Beat in the eggs, one at a time, and then the vanilla. Whisk the dry ingredients together and add to the wet, stirring just to combine. Spray an 8x8 baking pan. I like to line it with a long sheet of parchment paper so I can lift the brownies out for easier cutting, but that's optional. Spread the batter evenly into the pan and bake for 30-40 minutes, depending on your pan and your oven. Check with a toothpick, it should come out without wet batter on it. Cool the brownies before glazing. To make the glaze melt the butter in a small saucepan. Take off the heat and add the chocolate. Stir until fully melted. Mix in the cocoa powder, salt, vanilla and whiskey. Blend until silky smooth. Pour the glaze onto the cooled brownies and spread out gently with a spatula. Sprinkle on the walnuts. Let the glaze firm up before cutting into squares. The texture of these falls right in between fudgy and cakey — the best of both worlds! 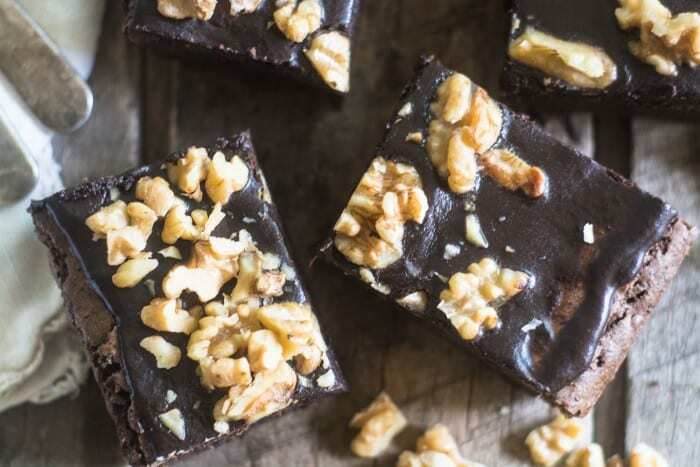 If you adore walnuts, feel free to add them to the brownie batter as well. You know by now that you don’t have to use the whiskey at all if you don’t want to, just leave it out, or use any other spirit you like, Baily’s Irish Cream, Amaretto, Kahlua, etc. The original recipes calls for dark rum, but I think the whiskey gives it a nice kick. Don’t forget to pin these Whiskey Glazed Brownies! Oh my! 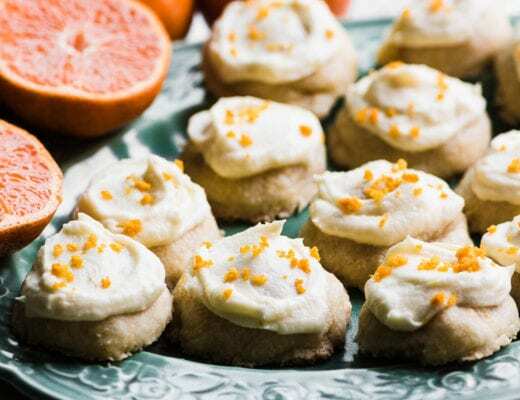 If I could only eat like a 16-year-old boy I’d be making these tonight :) I do have some family gatherings coming up so they’ll have to wait just a little while. They look delicious, Sue! Oh my, I love all these ingredients and how fabulous that you’ve added whiskey! Can I have a glass of whiskey while I munch on them too? These are heavenly and I’m making them for my next girls’ poker night! Oh wow, these have girls’ poker night written ALL OVER them! Hi Sue, the whiskey glaze elevates these to a new level, love the way they look, great pics! All of my favorites in one, oh yes these look fantastic. Bring on that whisky glaze I’m drooling already! You are so right, just by looking at them I can tell they must be something out of this world! How I wish I could bit into one of those right now. 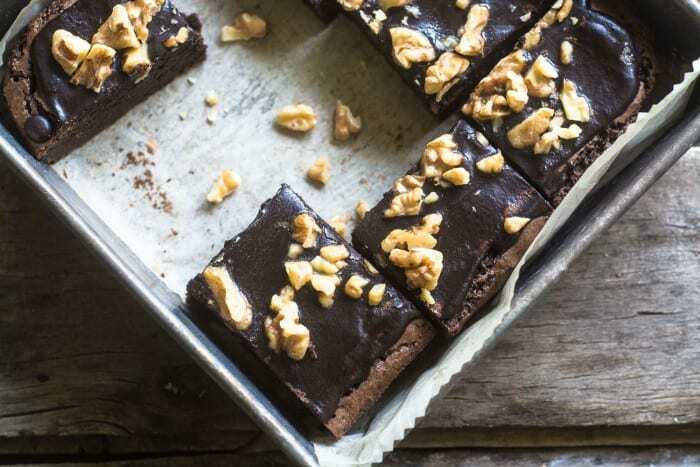 Brownies in any form or fashion are always top of my list! Love the whiskey glaze and walnuts, especially. I have to go to bed but this has got me feeling hungry! Looks delicious! You had me at whiskey glaze, what a dream! 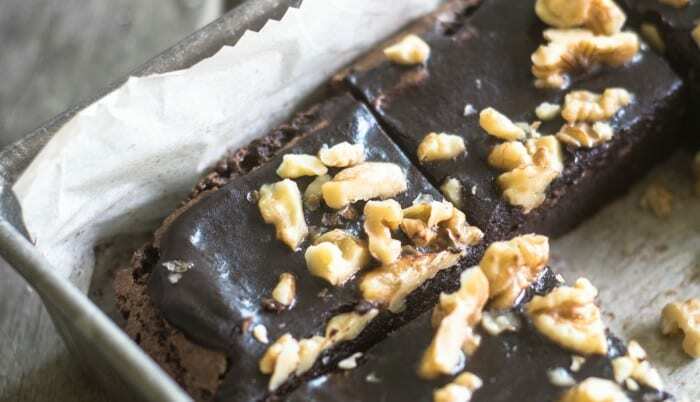 Love the whiskey in the glaze of these brownies – what could be better ? Yum! 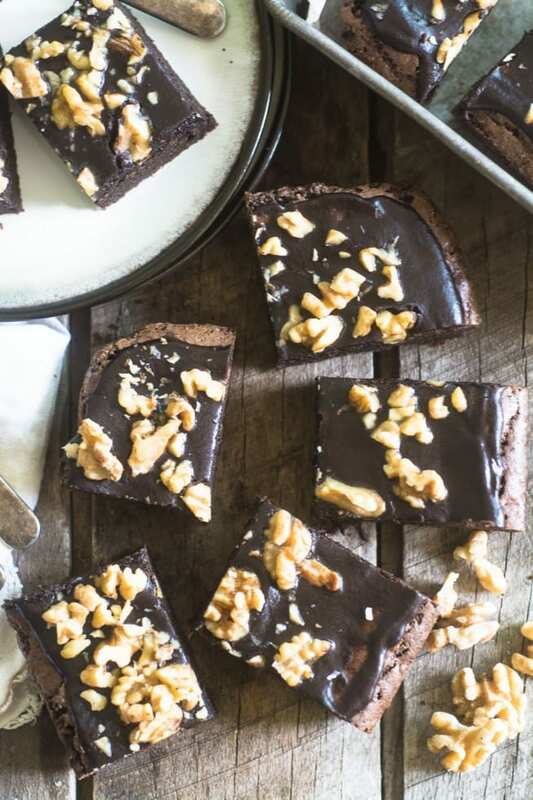 I have a weakness for brownies, these sounds like those super soft fudgey type brownies…..yummy! Pretty sure I need to make brownies soon! Lol. Sometimes I too find it hard to churn out 300 words. :) Brownies are one of the only few treats that I’d eat. I love them to death. Yum!. I know what you mean, I only succumb to treats when they are THAT good! That glaze sounds amazing! and walnuts + chocolate are my fav! I’m sure it doesn’t matter what kind of whiskey I use, right? :) And I agree with Chris — your photos sold me! I will be a hero (heroine!) to my husband when these show up. Chocolate, nuts — he’s all over it. Maybe I’ll keep the secret ingredient a secret . . . .shhhhhh. Yes, any whiskey you like to drink will be dynamite in these brownies, Rosemary. You didn’t need any words to sell me on these. The first picture told the story and had me drooling! Since it’s not stated in the recipe, at what temperature do you bake them? Count me in Sue! That whiskey glaze looks deadly and delicious! Is it wrong that I want these for breakfast? 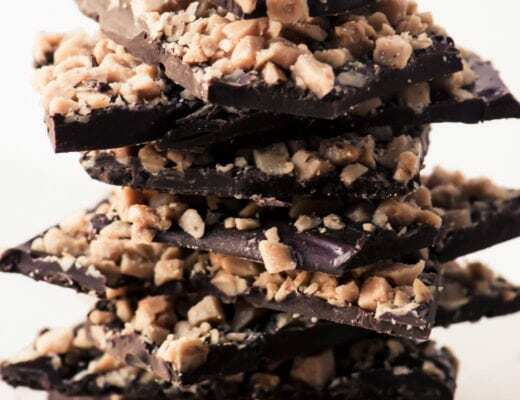 Chocolate, walnuts, whiskey – sounds like the beginning of a great country song! Seriously these look wonderful. The texture looks perfect and love the idea of a glaze instead of over the top icing. Yum!